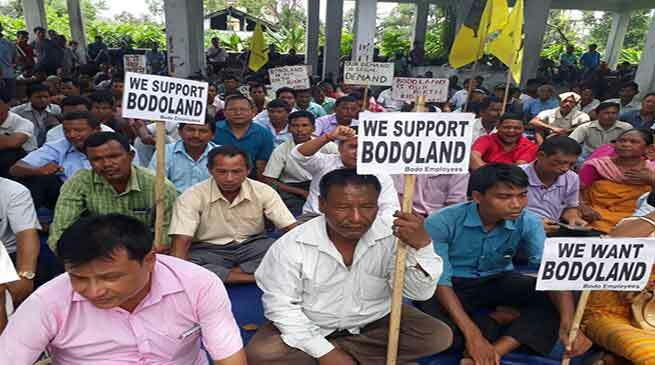 The Bodo Employees residing in BTAD area as well as other part of Assam have come up rising for demand of creation of separate Bodoland state. More than 15,000 Bodo Employees who are in service either State or Central government took part in three hours Dharna in support of their demand. Dharna was held at All District Headquarters across BTAD area and other part of the Assam. They also demanded the Grant ST (Hill) status to the Boro people living in Karbi Anglong and Dima Hasao districts of Assam. From the 3 hours Dharna the memorandum has been submitted to Prime Minister & Home Minister of India, demanding the early solution of issue related to creation of Bodoland. The Bodo Employees expressed their thanks to Central and state govts for arranging the Tripartite Talk in political level on Bodoland Issue on 26th April 2017. Bodo employees also expressed their feelings that ” It is a dream and aspiration of every Bodo to live with dignity of life within the new state”.